At my invitation, representatives of the five Arctic Ocean coastal states – Canada, Denmark/Greenland, Norway, the Russian Federation and the United States of America – met at the ministerial level in Chelsea, Canada on 29 March 2010. We had a forward-looking dialogue on issues related to our roles and responsibilities in areas under our jurisdiction in the Arctic Ocean. 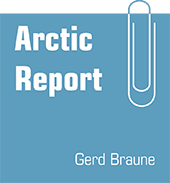 This was in furtherance of commitments in the 2008 Ilulissat Declaration and complements our discussions and collaboration with all Arctic states, Arctic indigenous peoples and others through the Arctic Council, the central forum for international cooperation on Arctic issues, and other fora. Bearing in mind that the extensive international legal framework that applies to the Arctic Ocean provides a solid foundation for peaceful uses and responsible management of this ocean, we took stock of recent developments in relevant international bodies and mechanisms. In particular, we noted the strong cooperation between Arctic Ocean coastal states in the scientific and technical work needed to delineate the outer limits of their respective continental shelves beyond 200 nautical miles. As outlined in the Ilulissat Declaration, we have a common commitment to the orderly settlement of any possible overlapping claims. We discussed the importance of remaining in close contact and deepening cooperation, as work progresses and further submissions are prepared. The Arctic is becoming more accessible due to climate change. As activity in the region increases, Arctic Ocean coastal states will be most directly affected by new public safety challenges. Our governments will need to prepare and respond, recognizing that international cooperation strengthens our national efforts. Arctic Ocean coastal states are fully engaged in working towards the development of a legally binding Arctic Search and Rescue instrument in the Arctic Council, and are committed to working towards its completion by the 2011 Arctic Council Ministerial meeting. In light of the prospect of increased shipping, we all place a high priority on the timely adoption of a mandatory regime for shipping in polar waters, cooperating to this end in the International Maritime Organization. We discussed the value of having our national agencies responsible for public safety issues consider these and other potential challenges in the Arctic and explore ways Arctic Ocean coastal states can share information and strengthen cooperation, consistent with national law. While development may be years in the future, the renewable and non-renewable resource potential of the Arctic Ocean presents tremendous opportunities for the Arctic Ocean region. Managed sustainably and through good stewardship, these resources can contribute to economic prosperity and social well-being, including for indigenous peoples, for generations to come. The Arctic Council has recently released a report on Arctic Energy and has approved Arctic Offshore Oil and Gas Guidelines. The five Arctic Ocean coastal states are committed to implementing these guidelines as appropriate to protect the Arctic marine environment from unwanted environmental effects. While large-scale commercial fishing in most of the Arctic Ocean is not imminent, we discussed the need for further scientific research into the state and nature of fish stocks and their ecosystems in order to assess emerging trends and their implications. There is an existing applicable and comprehensive international legal framework that applies to the Arctic Ocean and Arctic Ocean coastal states have a unique interest and role to play in current and future efforts for the conservation and management of fish stocks in this region. As the Arctic Ocean undergoes change, a solid knowledge base – built on Arctic science, research and traditional knowledge - will be critical for sound, long-term analysis and policy-making. It will benefit from enhanced coordination and communications. We will want to further encourage the excellent work underway, including the Arctic Council’s efforts to ensure a strong legacy to the International Polar Year, and facilitate access to both land and marine areas of the Arctic, consistent with international and national law, to strengthen cooperation amongst our scientific communities. We also discussed the value of the creation of an Arctic Regional Hydrographic Commission which would result in a better understanding of the features of the Arctic Ocean and its coastal areas, essential knowledge for safe navigation. Arctic Ocean coastal states have an important stewardship role in the region. By looking ahead, we are better placed to build a region that can fulfill its true potential and to ensure that change benefits its inhabitants.